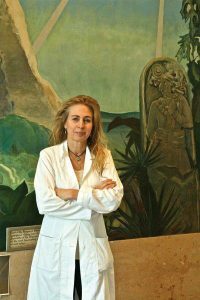 Elise, founder of Grenier Conservation, has spent three decades as a preservationist of historic art – both in Florence, Italy and her home state of Louisiana. In vastly different locales, she has restored public art with tremendous historical significance, paintings that provide glimpses into the past. She is careful when she uses the word “restoration,” which might imply the conservator is retouching the artwork. The goal of restoration is not to retouch, she explains. To properly conserve art, she works to preserve the original artist’s work without changing its nature. “If I can get away without doing any retouching, I have won,” she says. 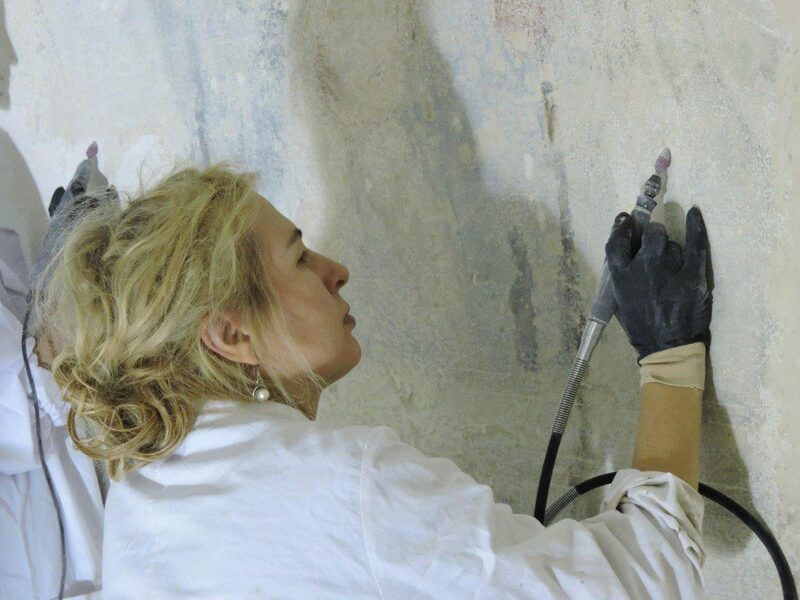 Elise’s philosophy of preservation has come from years of experience working in Florence, Italy. Over the years she has come to realize that often the proper course of conservation of a work of art is to monitor the deterioration of the piece, but not actually perform action. Higher quality artwork often doesn’t require intervention, she asserts; it’s the natural “wear and tear” of the aging process that lends history to the piece. The preservation process typically begins with physical assessment of the piece and its restoration needs, often including chemical analysis of the materials. Elise thoroughly researches the history, from the original artist to the (often many) restorers that added to the piece over the years. She then gives her “diagnosis” of what the art needs, providing a full conditions report and making recommendations for the best methods of conservation for the art in question. It is the responsibility of a conservator to preserve art in a reversible way, she explains, so that as preservation methodologies advance, they can always be improved upon. Elise is a member of ArtWatch International, an organization that monitors the preservation processes of public art; its goal is to monitor and campaign for better practices in the conservation of art works. Art conservation is a relatively new science, Elise says. She believes that the 1966 flood of Florence was a catalyst for the modern practice of preservation, which rose out of necessity when the city flooded, and much of the historic art along with it. Elise compares the flood to the effects of Hurricane Katrina in New Orleans – so much water sat in the city after the deluge that many buildings suffered from damage, and art historians scrambled to save priceless art and artifacts from ruin. “The flood triggered the practice in the sense that there was a critical need for practical solutions to preserve the important art in Florence,” Elise describes; modern art preservation and restoration came about as a result. 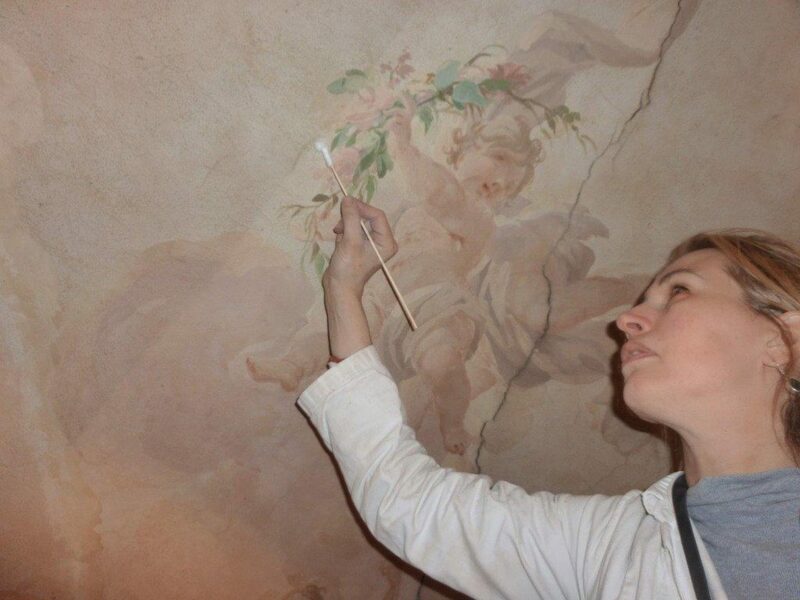 Elise came to Florence in the 1980s as a young art restoration student, and worked for two of the most prestigious conservation firms in the city before forming her own company, Grenier Conservation. Elise had the opportunity to work on renowned art in the UNESCO World Heritage site, including in Renaissance churches and villas, historic palaces, and none other than the Santa Maria del Fiore, Cupola of Brunelleschi of Florence, commonly known as the Duomo. 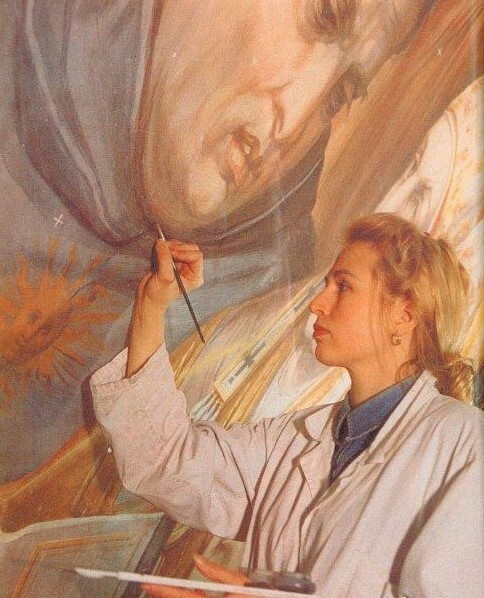 She was part of the team that conducted the restoration project of the frescos of the Last Judgement by Giorgio Vasari and Federico Zuccari (1572-1579). Elise didn’t know what art preservation was, initially. She was always interested in art, her love of drawing and painting fostered by her father (Charles Grenier, professor emeritus in LSU School of Social Work), and she went to LSU for her B.A. in fine arts and art history with a minor in Italian. She comes from an “LSU family,” she explains, having grown up in Baton Rouge and often visited the campus where her father worked. Elise was hooked. After graduating with her M.F.A. in art history from LSU she moved to Florence for advanced study of fine art restoration and conservation, earning degrees from the L’Universita Internazionale dell’Arte e Restauro and the Associazione Intercommunale Fiorentina. There she learned the methodologies of preservation. Over the years she worked on dozens of projects including the Church of Santa Croce, the Bargello Museum, and the Palazzo Pitti. “I’m very proud that I’m Florence-trained,” she says, citing the Italian city as the source of conservation best practices. Now Elise has brought her years of experience restoring the artwork of the Italian masters – alongside the Italian master preservationists – in Italy back to Louisiana. Her preservation process for Renaissance frescoes is exactly the same as when approaching Art Deco murals in the United States. The historic murals in Allen Hall depict scenes of Louisiana—and LSU—life in the 1930s. 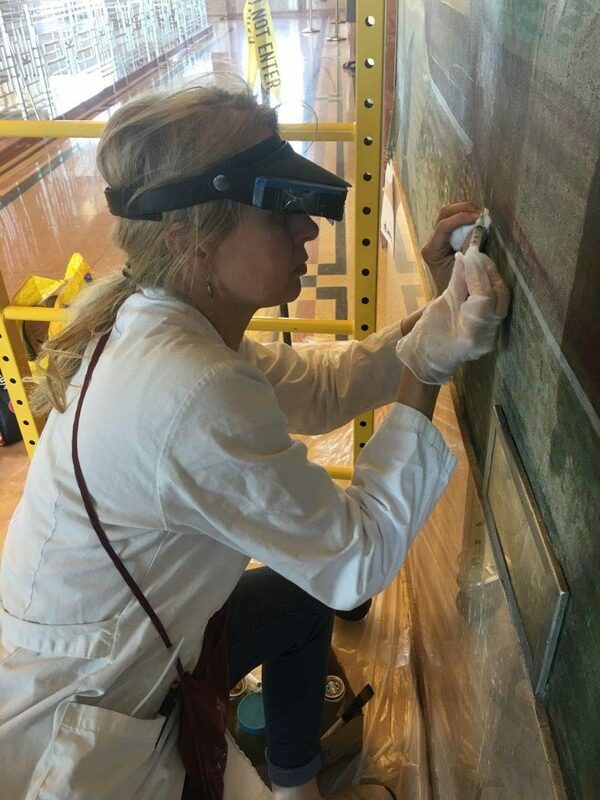 Portions of the paintings had faded from their original vivid colors, and Elise performed a non-invasive cleaning methodology to remove 70 years of dust accumulation. 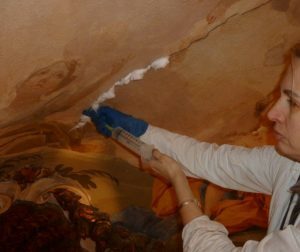 During the restoration work the student artists’ theses were consulted, and another fresco was discovered to have been part of the original project – over the years it had been completely covered by layers of latex paint. Testing the portico wall established its continued existence, and after the paint layers were removed, the large painting was recovered completely intact. Bringing her expertise from Italy back home to Louisiana feels like she has come full circle. In Louisiana Elise has also restored murals at the Lakefront Airport in New Orleans, the Louisiana State Exhibit Museum in Shreveport, and paintings in several South Louisiana churches and plantations, including the historic Whitney Plantation. 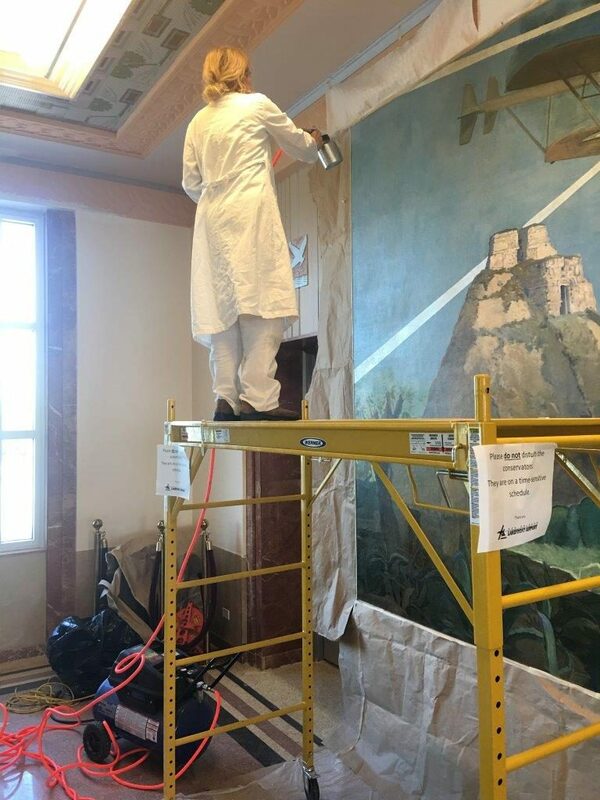 Most recently Elise has worked on the restoration of the artwork in the Louisiana State Capitol in Baton Rouge, which were painted in the Art Deco art style during the Huey Long administration. 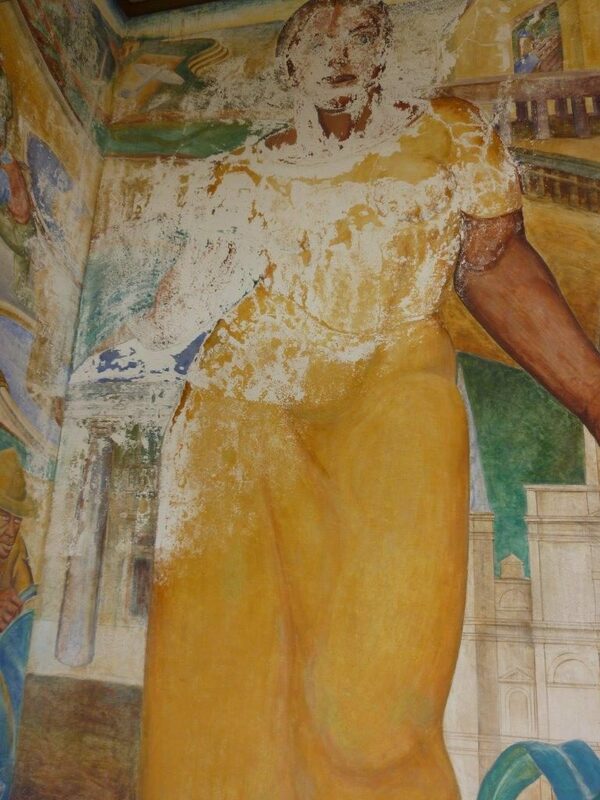 The murals in the Capitol Annex, painted by Albrizio, were commissioned as part of the New Deal public arts programs during the Great Depression when the new State Capitol building was constructed in 1931. As a former student of art history, Elise appreciates the historical significance of the work she works to preserve, even if the physical process is often taxing. Many of the paintings she restores, such as the Louisiana Capitol ceiling art, are 35 feet up in the air; thus, Elise spends a lot of time working on elevated platforms, looking up. But it’s absolutely worth it.